As a child Nate was always dreaming up new airplane designs. He would build scaled models of his designs and then test fly them off the front porch and barn roof. However, he took his dreams a little more seriously than most kids his age. After the models came the gliders, which were towed behind motorcycles and trucks. Nate's younger brother Thad was often piloting or towing the gliders. As with any design there were initial problems. The gliders rarely made it off the ground without the help of a large hill and a high rate of speed. Nate however, was rarely discouraged and quickly went about redesigning the gliders. 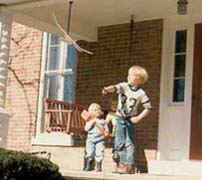 Family members would often visit to get a glimpse of the next flying machine. Nate's uncle Pete quickly named the Halsmer workshop The Monitor Skunk Works. The next logical step was powered aircraft. After watching his son's first attempts at flight, Joe jr. decided Nate should obtain some formal flight training before things got out of hand. At age 13 Nate began flight instruction at the local airport. 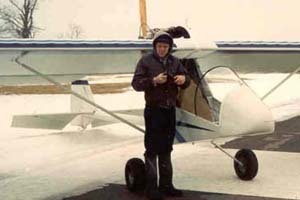 He flew a Cherokee 140 and obtained 10 hours of instruction. His father then began giving him instruction in the families 1946 Cessna 140. Around the same time Nate was also helping his father build a Kolb Firestar. After its completion Nate was allowed to taxi the aircraft around the airport. While taxi practicing for the first time he became airborne almost immediately. This solo occurred at age 14, and he as been flying ever since. His adventures didn't stop in the back yard. At age 16 he flew the Kolb to Oshkosh and has returned every year since. He has flown the Kolb, a Zing, a Smith Miniplane, and the Cessna 140 to Oshkosh. He received his Pilot's License at age 17. At 19 he received his Basic Flight Ultralight Instructor rating from Delphi Aviation and currently gives ultralight instruction. Nate had a strong desire to follow in his grandfather's footsteps. Because he lacked the money to purchase an airplane he would need to construct one. What he needed most was the opportunity to critique others designs. At age 16 he began his career as a test pilot for Pop's Props in Bloomington, IL. According to Nate this gave him invaluable design experience which he used to construct his first powered aircraft. 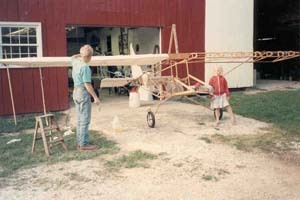 Nate began construction of the, as yet unnamed, red biplane in 1995. It took two years, but at age 19 he had completed his first powered airplane just a few weeks before Oshkosh. Not bad for a teenager. In the Fall of 1997 Nate enrolled at Purdue University to study Aviation Technology. He finished two years at Purdue and then decided it just wasn't for him. Nate began competing at KIMO in 1997. 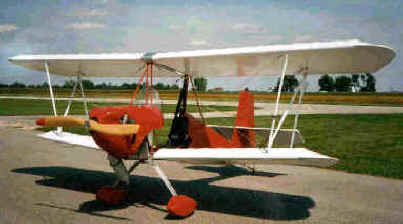 In 1998 using a borrowed Quicksilver Sport he managed to fly away with the National Championship. 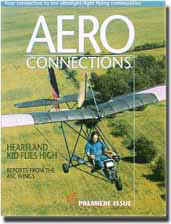 To learn more about this competition please visit the Aero Sports Connection (ASC) homepage.